This creamy raw chocolate mousse made from cashews and raw cacao is topped with a layer of bittersweet chocolate ganache and cacao nibs for extra intensity. Oftentimes recipes come with back stories; there are family favorites, forgotten classics, cultural discoveries, fresh market finds, but sometimes they stand on their own. This is one of those cases, because if we are being honest, chocolate mousse doesn’t require much coaxing to make. Smooth yet intense, chocolate mousse is worthy of celebration, the unforgettable ending to an elegant meal. It’s in the dessert big leagues, a special treat to be savored; each silky spoonful something to be lingered over. More full-bodied than your average mousse it has a whipped texture that’s creamy, supple and smooth. It’s topped with a layer of bittersweet chocolate ganache for extra intensity. If you have the time, plan on starting a day before serving so that they have time to firm and set up in the fridge (although 4 hours will do if you are impatient like I am). 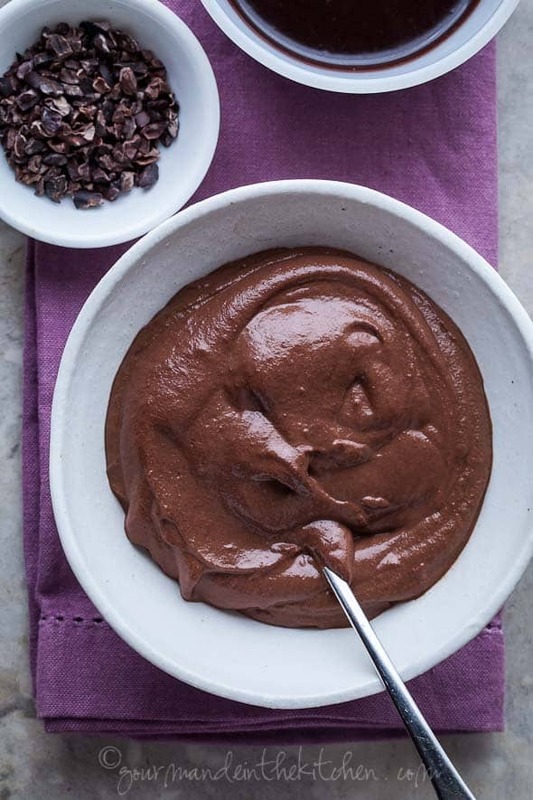 While objectively this mousse is firmly in the “eat occasionally” dessert camp, it boasts the inclusion of raw cacao which is rich in anti-oxidants (more so than even blueberries) and magnesium (which most of us could use more of). Dates offer a subtle honey-like sweetness along with other essential minerals while the coconut oil helps us to absorb fat-soluble vitamins and keep us feeling full and satisfied. 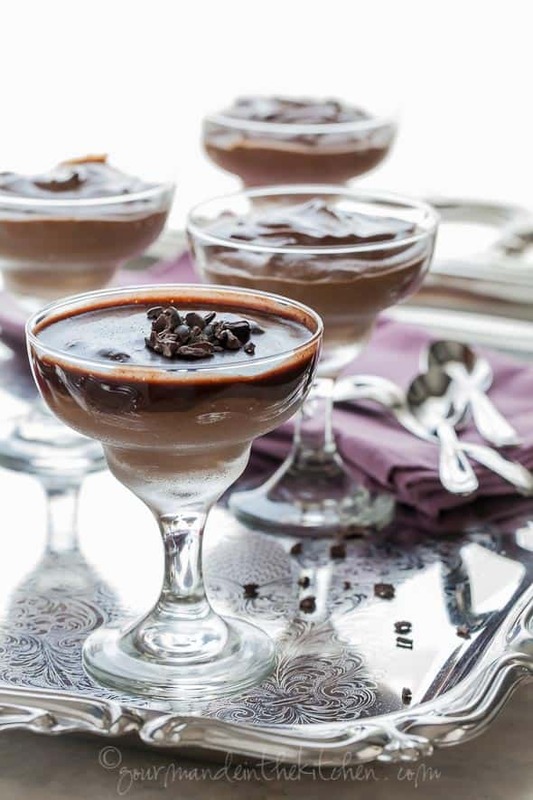 A creamy smooth raw chocolate mousse topped with a layer of bittersweet chocolate ganache for extra intensity. 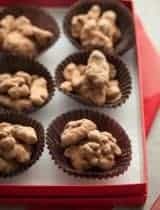 Cover the cashews and pitted dates with water and soak for at least 4 hours or overnight in the fridge. Drain cashews and dates and place in a high-speed blender with filtered water, melted coconut oil, cacao powder, salt and the seeds from the vanilla bean. Blend until completely smooth, scraping down the sides with a spatula occasionally adding extra water a Tablespoon at a time as needed. The mixture should be creamy, smooth and the consistency of a loose batter when done, mousse will set and firm as it cools in the fridge. 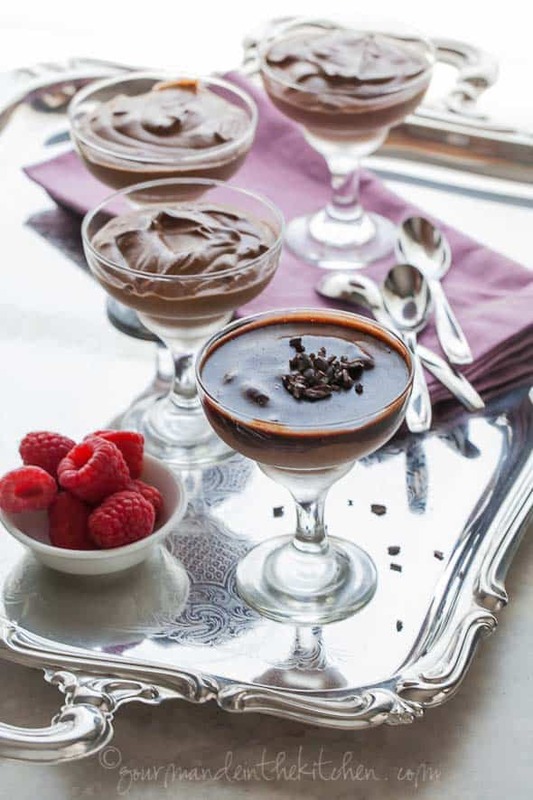 Spoon mousse into individual serving bowls and place in fridge while making ganache. In the food processor, blend together the maple syrup and melted coconut oil until well combined. Add in the cacao powder and process until smooth scraping down the sides as needed. 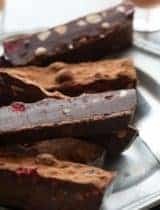 Pour the chocolate ganache over mousse and top with cacao nibs if desired, cover and chill for at least 3 to 4 hours or overnight. Remove mousse from fridge at least 10 minutes before serving for a creamier consistency or serve chilled for a thicker consistency. 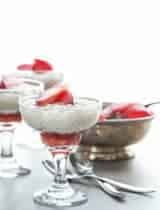 Serve with berries on the side if desired. Gorgeous mousse, Sylvie! I make a raw/vegan mousse with avocado, cocoa, agave and vanilla. That's it and just blend like crazy. 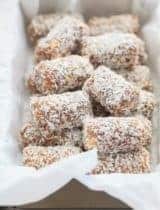 I love that you worked in cashews and coconut oil and dates! Delish! Oh yum, Sylvie, love those shots too. For the past week we have been moving house and since I am not used to 12 hour-long daily physical challenges like this my body has been craving magnesium (yes, chocolate). 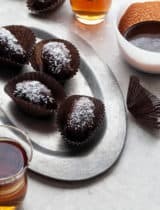 This might be the perfect treat for us to indulge in with feet up on our new back deck thought I'd probably use some rice syrup to lower the fructose content a little. DELISH! Love that you added dates to this! Raw mousse makes me happy, so I'll definitely have to try your version! 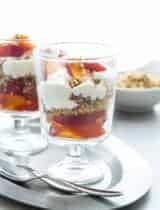 This looks so decadent - I love how easy and elegant this looks Sylvie - beautiful! This is perfect! I love that it this is dairy free. I could really enjoy this! This mousse sounds fabulous, Sylvie! I love that you used dates and coconut oil. Gorgeous! Pinning! What a great recipe Sylvie, it looks delicious. Omgosh. I'm dying. It looks so yummy!! Gorgeous photos Sylvie!! Gorgeous, your mousse looks so velvety - chocolate heaven! Wow, what a mousse! This looks so decadent and delicious, I love it. That is perfect for a dinner party. Toss some coconut whipped cream on top, shaved dark chocolate and maybe some organic berries or cherries. Great recipe! I just want to take a dessertspoon and dip right in.... may I please? This looks really good and really healthy! I just bought some raw cacao and it is delicious! I am going to have to try this!!! This mousse sounds terrific, Sylvie! I've never seen such a nutritionally redeeming mousse, no less. What a gorgeous idea. 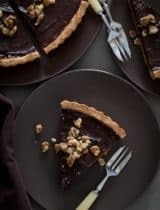 I adore mousse made with eggs but those photos have convinced me to give this a go - the ganache especially sounds divine! Sylvie, you are so right - chocolate mousse doesn’t require much coaxing to make :) Loved the clicks as always!!! I absolutely love the healthy take you showcase on all your desserts. In this case, usage of cashew with date sounds a-mazing! Loving the mousse Sylvie. Healthy and delicious. Beautiful photos as always. I just love how you've updated a beloved classic, Sylvie, and it's just as pretty as it sounds. Beautiful, actually. Holy cow - this is the definitive answer to all people who think that raw food consists of tasteless crackers and carrot sticks! Absolutely luscious looking mousse and glorious shots. Thanks for tempting us, Sylvie! What a delightful dessert. 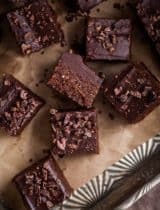 I tried a few raw desserts and I wasn't impressed to be honest but this looks smashing! I certainly wouldn't need much coaxing to enjoy one of these! It looks absolutely divine Sylvie. Though it is one of my favorite desserts, I have never made mousse. I love the unique take on your recipe. It sounds fantastic and one to try out soon. Thanks Sylvie! Sylvie, Your chocolate mousse looks and sounds divine! I'm a chocolate lover and looking at your beautiful pictures makes my hungry! Thanks for sharing a healthy and delicious recipe. I'm in love with your magic - you make simple delicious thing and take the most beautiful photos! 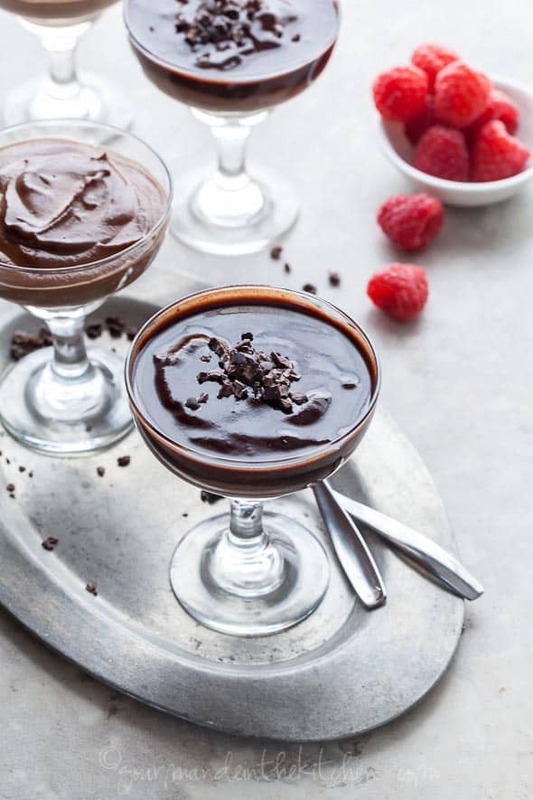 Such a healthy way to enjoy chocolate mousse! This looks so smooth and rich, I love it! It looks so good! Thanks for the recipe! Oh my goodness, this truly sounds delicious! Bookmarking now! This looks so good, Sylvie. I am going to have to make this this weekend - just for the "heck of it"! Finally a chocolate mousse that meets my paleo needs that doesn't contain avocado. I think I'm the only person ever that can't get my head around the avocado, i hate it! Thank you, ill be trying this on the ASAP.